The Kaunas pogrom was a massacre of Jewish people living in Kaunas, Lithuania that took place on June 25–29, 1941 – the first days of the Operation Barbarossa and of Nazi occupation of Lithuania. The most infamous incident occurred in the Lietūkis garage, where several dozen Jewish men were publicly tortured and executed on June 27. After June, systematic executions took place at various forts of the Kaunas Fortress, especially the Seventh and Ninth Fort. As of June 28, 1941, according to Stahlecker, 3,800 people had been killed in Kaunas and a further 1,200 in other towns in the immediate region. Some believe Stahlecker exaggerated his accomplishments. Wikimedia Commons has media related to The Holocaust in Lithuania. ↑ Arvydas Anušauskas; et al., eds. (2005). Lietuva, 1940–1990 (in Lithuanian). Vilnius: Lietuvos gyventojų genocido ir rezistencijos tyrimo centras. p. 203. ISBN 9986-757-65-7. 1 2 MacQueen, Michael (1998). 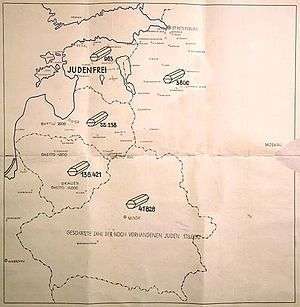 "Nazi Policy towards the Jews in the Reichskommissariat Ostland, June–December 1941: From White Terror to Holocaust in Lithuania". In Gitelman, Zvi. Bitter Legacy: Confronting the Holocaust in the USSR. Indiana University Press. p. 97. ISBN 0-253-33359-8. 1 2 3 4 Bubnys, Arūnas (2003). "Lietuvių saugumo policija ir holokaustas (1941–1944)". Genocidas ir rezistencija (in Lithuanian). 13. ISSN 1392-3463. English translation of excerpts from Stahlecker's report available here: "The Einsatzgruppen: Report by Einsatzgruppe A in the Baltic Countries (October 15, 1941)". Jewish Virtual Library. American-Israeli Cooperative Enterprise. Retrieved 2015-03-29. ↑ Oshry, Ephraim (1995). Annihilation of Lithuanian Jewry. New York: Judaica Press, Inc. p. 3. ISBN 1-880582-18-X. ↑ Budreckis, Algirdas M. (1968). The Lithuanian National Revolt of 1941. Boston: Lithuanian Encyclopedia Press. pp. 62–63. OCLC 47283. Again for some unknown reason, Stahlecker exaggerates his statistics. 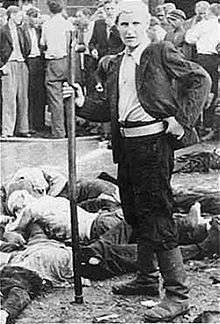 The account by L. Shauss to the Soviet Extraordinary State Commission stated that in "the first pogrom on June 25–26, in the Kaunas suburb of Slobodka (Vilijampolė), 600 Jews were killed on Arbarski, Paverski, Vilyuski, Irogalski streets." ↑ Sužiedėlis, Saulius (Winter 2001). "The Burden of 1941". Lituanus. 4 (47). ISSN 0024-5089. On the other hand, notwithstanding a number of such incidents, the available evidence does not support the image of huge mobs of locals hunting down Jews by the thousands even before the arrival of the Germans as some have claimed. ↑ Greenbaum, Masha (1995). The Jews of Lithuania: A History of a Remarkable Community 1316–1945. Gefen Publishing House. p. 307. ISBN 9789652291325.